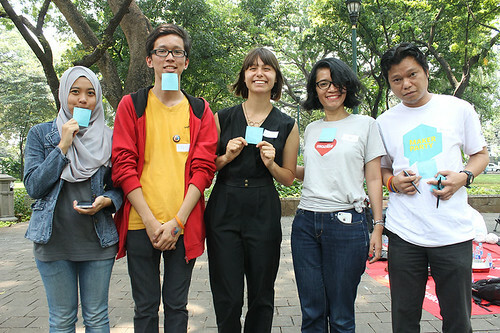 Last month, we, Mozilla Indonesia, have unexpected guess from Germany (and Japan!). Michelle Thorne, who is Mozilla’s Global Strategist for Webmaker Mentor team and currently living in Germany and Gen Kanai as Asia Community Engagement. 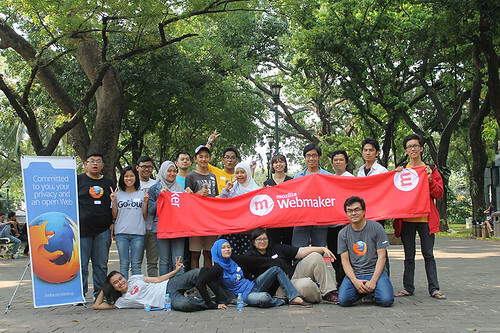 Since Michelle is in Webmaker team, it would be great to offer her some Maker party experience while in Indonesia. In that regard, we scramble ideas on what to do and how to do it. Took us 12 hours to wrap the ideas from activity type, picking location, budgeting, and meals. Remember, when we have Shinta on the team, meals is priority number 1! Due to time constraint and cost limit, we choose to have offline event. Actually, this is an opportunity to us to experiment on LoFi-NoFi maker party. Next issue, to have offline event, we’ll have to choose open space that is big enough and crowded. 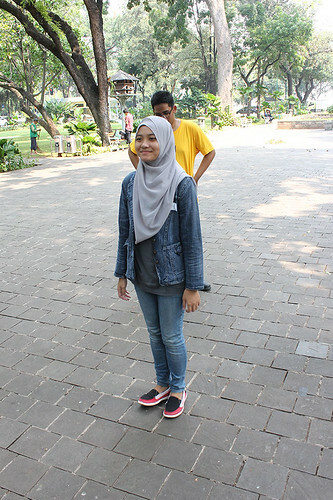 We ended up choosing Taman Suropati. The time would be around lunch time. Meals will be Rara, Ina, and Shinta’s responsibility. Having all the planning wrapped up, we move to #MozKopdarJKT to have meetup with local mozillians community in Jakarta. On the next day (August 30th), around 8AM, me and Fauzan was tasked to tag the location so that, the specific part of the park will be in our possesion for the duration of the event. 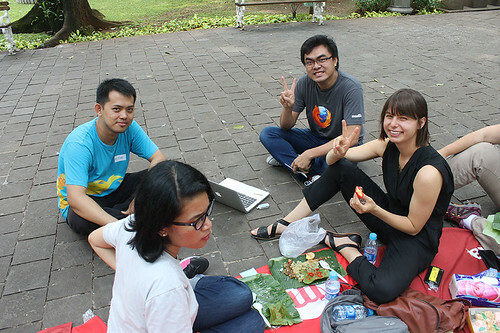 We call it #MozPicnic, because we did picnic in the park :). Around 9AM, Fadhil came with table cloth and standing banner. On 10AM, Rara, Michelle, Shinta and Ina came with snacks and meals. Around 11AM, participants starting to come one-by-one, also Yofie came around this time. Sometimes later, Andi ‘Belutz’ came to join us. At about 12PM, we started the Offline Maker Party. The first activity was called “Catch The Signal”. It teaches the participant the concept of computer network. How packet moves from one computer to another computer via hub / router. It also teaches what happen when there are firewall or broken networks. The signal in this case is balls made out of scrapped papers. Next activity, we play “human programming”. What is it? we… it’s kinda bullying people to do what we want :D. You ask a person to do something and the person must do the exact request. After having fun bullying participants (sorry guys, we do have fun! :D) we move to another activity called “human html tag”. In this activity, we divide participants into groups of 5 person. Each person in the group will be given certain html tag. After all person have tag, we put them all in one big group, randomize their position. After they are randomize, we ask them to go back to their own group and while going back, they have to sort the tags in the right order. It is so fun looking at participants sorting their self :D.
The last activity, we (again) divide participants into groups of 5. 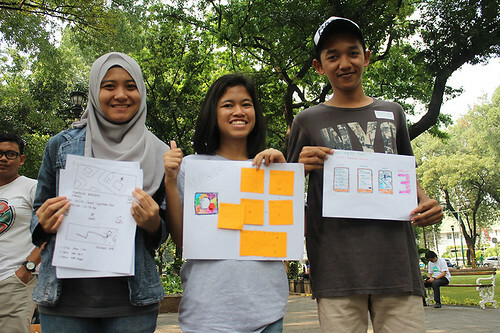 In this activity called “Make an App”, we ask participants to discuss a problem and make an app based on their discussion. At the end, we have 3 interesting apps created on paper. Throughout the day, we have so much fun doing these activity even without internet. We get in touch with actual people, enjoying the park, while at the same time, we learn so much! This successful experiment has lead us to try to replicate it in another cities. So… wait for news from us for another LoFi-NoFi maker party near your area :).